Summer ‘vacation’ is in full swing. If you are a parent, you probably understand that summer is a vacation for the kids, but certainly not one for yourself. It can be a task, keeping your children occupied, keeping their pre-adolescent bellies full, and cleaning up after them more than any other time of year. Adding to the harried summer days, is the unbearable heat that is common in Northern California. We try to get away when we can, such as camping and other short trips, but it is difficult and time consuming, both preparing for departure, and coming home to clean-up. So, my blog has suffered, as it has been put on the back burner. I have made quite a few great recipes and have snapped some pictures and cataloged them, but haven’t had the time to post them here. Today, I will share one of my recent meals: Shrimp Tacos. 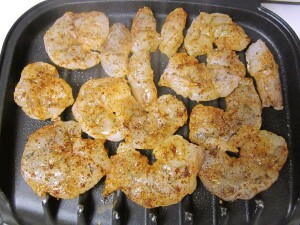 One of my handicaps is barbequing, so when I grill, I rely on my George Foreman Grill. By all means, this can be prepared on an outdoor grill or even in a fry pan. Even though there are more than a few ingredients in this recipe, it is truly a very quick and easy meal. Just add some corn and avocado to store-bought salsa verde… the shrimp only takes a few minutes to cook… and in a total of about 20 minutes, you’re ready to eat! If this recipe looks like a good one, you should check out my Fajita Marinade. 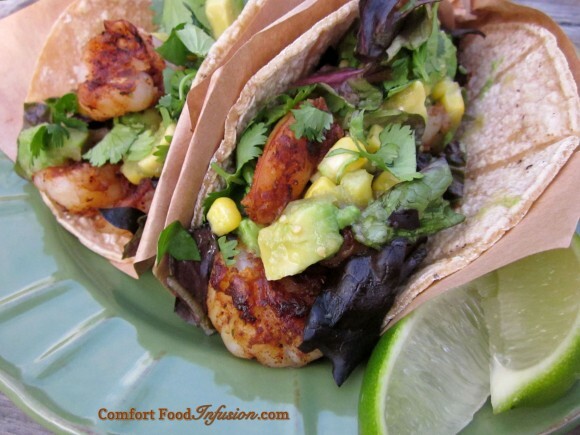 You may even decide to use the marinade for the shrimp…. or just follow the recipe below for a quick sprinkle of seasonings. Simply season, grill, and top with salsa verde, corn and avocado. In a medium bowl, combine salsa verde, corn and chopped avocado. Set aside. Clean and remove tails from shrimp. If your shrimp is very large, cut them in half, lengthwise. Arrange shrimp in a single layer on a large surface or plate. Sprinkle shrimp with chili powder, cumin, seasoned salt, and cajun seasoning (if using). Flip over and season the other sides. (You can let these marinade for 20-30 minutes, but I don't). Grill shrimp for about 2-3 minutes per side. (In my George Foreman Grill I simply close the lid, and they were done in about 2 and a half minutes). Shrimp is done when it begins to curl and turn pink. Serve in corn tortillas with salsa verde, cilantro, cabbage or lettuce, and lime wedges on the side. You can grill these on an outdoor grill, or even in a fry pan. Do not overcook shrimp, as they will turn rubbery.